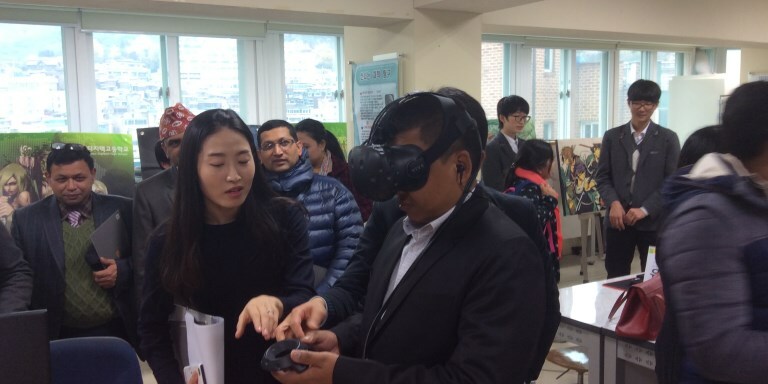 A visitor to Seoul Digitech High School tries on a virtual reality headset. The Republic of Korea has a highly developed and integrated ICT system in its education sector. Photo credit: ADB. The Republic of Korea’s shift to an information and communication technology-based education system provides useful lessons for other countries looking to make similar changes. Less than half a century after emerging from the Korean War, the Republic of Korea has transformed its economy into one of the most successful in Asia, supported by a state-of-the-art education system. At a workshop in Seoul organized by the Asian Development Bank in November 2016, Dae-Joon Hwang, an information and communication technology (ICT) in education expert, outlined the steps taken to achieve this transformation and presented ideas for countries looking to go down a similar path. Moving away from the traditional classroom setting focused on rote-based learning, with students as largely "passive" recipients of knowledge, requires a major shift in mindset. Following the Korean War, the Republic of Korea sought to rebuild its economy and to become globally competitive. Policy makers realized that education needed to play a key role in leading this change. To do so the education system needed to become more innovative, "student-centric," and focused on supporting creativity, collaboration, and critical thinking. Making the shift to a technology-focused education system requires carefully calibrated steps, carried out systematically over a long period of time with full support from government, parents, teachers, and other stakeholders, along with sufficient resources. The Republic of Korea has made this transition in a relatively short period of time starting with audiovisual education in schools in the 1970s, the introduction of formal computer education in the 1980s, and a series of master plans starting in 1996 through to the present, that have fully embedded ICT in the system. By 2000 every school in the country had internet connectivity. Among the major innovations that have been introduced along the way are digital textbooks in 2007, which encourage greater interaction between students and teachers, and the adoption of the SMART education initiative in 2011 that aims to engage and empower students by putting them at the center of learning. Cyberlearning was also adopted in 2004 with the goal of reducing out-of-school expenses and narrowing the education gap between regions in the country. It is a free internet-based, e-learning service based on the national curriculum that enables students to supplement school classes. As of 2015, there were over 2.1 million subscribers to the service. The adoption of cyberlearning has seen substantial improvements in educational outcomes, including a more than 12% improvement in academic achievements since startup, and strong increases in building effective learning habits and raising interest in different subjects. effective performance monitoring, evaluation, and feedback. strengthen work efficiency and transparency. Policy makers need to adopt a holistic approach to ICT development, which covers all the elements from planning through to implementation and feedback. Government leadership and cooperation amongst stakeholders from the national to the school level are necessary for creating the right environment for ICT adoption. Creating a digital national framework for educational services ensures consistency, efficiency, and cost effectiveness. Parent "buy-in" (public-private-parent collaborations) for new ICT innovations is essential for their success and sustainability. Nurturing and rewarding teachers who embrace new technology is key to promoting the use of ICT in classrooms. Creation of a think tank like the Korea Education Research and Information Service (KERIS) is helpful to provide overall support for ICT development, coordination of stakeholders, and data for decision-making. In the absence of such a think tank, education sector leaders should look for a “buddy” organization to carry out the role. Countries should promote open educational resources and the use of open source software, as well as fostering a culture of innovation. All media options should be considered for digital content delivery rather than relying solely on wire-based internet services. Effective security systems are necessary for privacy and protection of data. Korea Education and Research Information Service. Dae-Joon Hwang is on the faculty of Sungkyunkwan University in Seoul and a governing board member on UNESCO’s Institute for Information Technologies in Education. He was secretary general of the Korean Council for University Education, and president of the Korea Education Research and Information Service (KERIS). He has more than 15 years experience consulting on ICT in education.